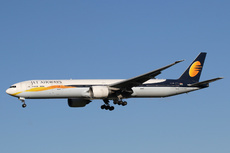 Jet Airways flight 9W234 returned to land at Amsterdam-Schiphol International Airport, Netherlands after reports that the aircraft suffered a tail strike on departure. The Boeing 777-35RER took off from runway 18C at 11:05 LT.
About 11:10 the Departure controller radioed that the Tower controller thought that the observed a tailstrike on rotation, but that the runway controller did not notice anything. About 11:12 the Radar controller cleared the flight to climb to FL240. However, about two minutes later the flight requested permission to stop the climb at FL150. Subsequently a request was made to turn back to Schiphol Airport and to descend. The Rdaar controller issued vectors and cleared the flight down to FL100.